Una moderna pareja de Los Ángeles organiza una cita a ciegas para dos de sus amigos, uno de los cuales es una criatura primigenia. Desafortunadamente, la noche del encuentro, dos invitados inesperados aparecen en la cena para hacer la situación aún más incómoda. Una comedia macabra con influencias de Luis Buñuel, David Lynch, y/o H. P. Lovecraft. I’m from New England, and if you live up here you’re aware of H.P. Lovecraft. I’ve always loved horror. I subscribed to Eerie, Creepy, Monsters, Fangoria. Stephen King’s first compilation of stories “Nightshift” came out when I was in the 6th grade. “Jerusalem’s Lot” was derived directly from “The Call of Cthulhu” by Lovecraft. As soon as I realized that, a light went on. I was always aware of Lovecraft but I wasn’t a fanatic like some of the horror guys you encounter, who are all about it. So after a decade of working in New York, my wife and I moved to Providence, Rhode Island. I missed New England and our New York was done. We bought a 150 year old creepy Victorian rectory, a house that Lovecraft might have been in at one time or another. We have lots of friends there who say they have evidence that Lovecraft wrote about their house, or was there. The city is steeped in a Lovecraft vibe, and I got more and more into it. It made me aware that I had to do a short film, because all I’ve done for twenty years is commercials. I had to do something that isn’t a commercial that’s longer than 30 or 60 seconds. I was with the two writers who are friends of mine on a dark and stormy night at a bar where Lovecraft surely used to go and smoke hash. I said “you’ve got to help me write this.” They said “ok what do you want to write about?” I said “I don’t know, Cthulhu goes on a blind date.” They just started cracking up. It was one of those things where you wake up the next day and say “you know what? I’m going to pursue this.” Those guys whipped up a script, and we had a it for months before everything finally converged and we could make it. 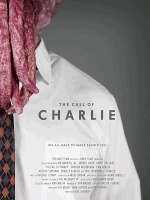 amfm-magazine.com - Director Nick Spooner: From the harvard Lampoon totide commercials, and his new shorty film "The Call of Charlie"